Water isn’t something we tend to think of as “geologic.” Yet all of the water now present on earth has been here since the planet formed. For 4.5 billion years, water has functioned as a geologic agent that dilutes, dissolves, and erodes—all the while assembling with other earth materials in highly consequential ways. Consider the fact that water we drink today has been through the kidneys of dinosaurs. Water continues to be a commanding mover and shaper of the earth’s materiality and the landscapes we inhabit today. It’s no surprise that water is of great interest to geologists. Our work on the Geologic City project has made us realize that cities, and New York City in particular, are spaces of tremendous geologic remixing. In New York, earth materialities flow through and among one another, releasing wildly new configurations that defy “zero waste” as a potential outcome. In many cases, water is a primary driver of these remixings. Water in New York mixes with humans, passes through city streets, generates energy and facilitates flows of goods, materials, and waste into and out of the City. Recently, we used our last few site visits for Geologic City to consider how water’s pathways within and through New York create dynamic spaces of unpredictable exchange—and how flows of water help compose the City’s unique geologic anatomy. One tenet of complexity theory is that some processes are irreversible. For example, it’s impossible to unscramble an egg. Similarly, assemblages that include water are highly complex and incredibly difficult to reverse or disentangle. That’s why, despite currently having some of the best tasting and cleanest water in the country, so many people in New York are willing to offer ongoing vigilance, and sometimes take up legal action, to keep the City’s drinking water safe from overt sources of contamination. When geologic materials assemble and take on new forms, they don’t disappear, they simply become something else that continues to “act” in and upon the world. These new assemblages spawn fundamentally different consequences as they propagate —and many of these consequences aren’t yet fully understood. Water generates effects at a geologic scale because of its propensity to move, mobilize, and pass through. The extreme challenge of controlling such a volatile force cannot be overestimated. This reality is vividly illustrated as workers in Fukushima continue their best attempts to capture highly radioactive water on-site. Concerns are growing in relation to the many unknowns surrounding the plant’s radioactive water as it links up with larger flows such as the Pacific Ocean. New York has elaborate systems in place to protect humans from the dangerous geologic and biological agents that water can so easily deliver. How well they all work is a subject of growing debate. In 2010, The New York Times published an extended series called “Toxic Waters.” It includes state by state information about how water pollution affects local drinking water. For New York state, the “What’s in your Water” piece details 5,348 facilities that have permits to release pollutants. The online version of the article invites readers to enter a zip code and view information on companies that actively discharge pollutants in their local area. Human dependence on water to survive means that any attempt to harness and safely deliver water throughout a place as large as New York City becomes big business requiring enormous infrastructure. It’s a highly impressive feat to deliver 8+ million residents, plus visitors, and residents of Westchester, Putnam, Ulster and Orange counties more than one billion gallons of potable drinking water every day. Flows that arrive from beyond the City’s edges are often propelled by monumental forms of infrastructure. Luckily, these flows are assisted by ancient geomorphologies such as the now highly eroded slopes of prehistoric mountains north and west of the city. The remarkable reality that 97% of NYC drinking water reaches homes and businesses today through gravity alone is an incredible gift from the geologic past that preceded New York’s existence as city. 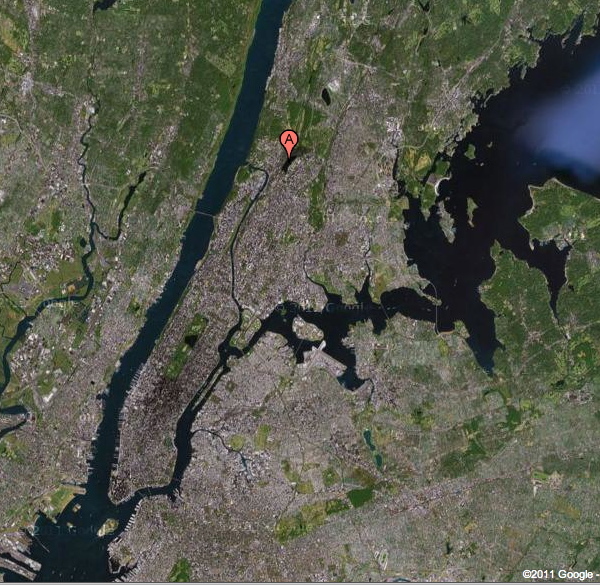 Still, humans have a huge, active hand in channeling water from Upstate into the homes of millions of New Yorkers. Tunnels, pipes, aqueducts and channels pass under the streets, through our walls, and in places beyond our wildest imaginations to usher the region’s water into our daily lives. The City actually enlists deep-sea divers to live for more than a month at a time in a sealed 24-foot tubular pressurized tank complete with showers, a television and a Nerf basketball hoop, breathing air that is 97.5 percent helium and 2.5 percent oxygen. The divers assess and repair aging and cracked tunnel infrastructure, which has been known to leak upwards of 35 million gallons a day. City Water Tunnel No. 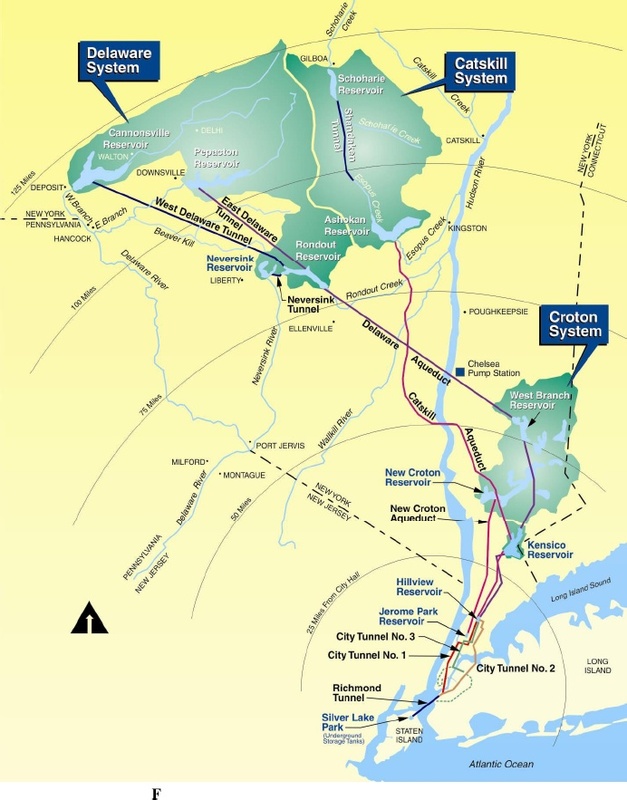 3, a 60 mile long tunnel which has been under construction since 1970, is a noteworthy piece of the ever growing NYC water delivery puzzle. Tunnel No. 3 is slated to be completed in 2020 at a cost of $6 billion dollars. It involves drilling through bedrock at depths over 800 feet. This hulking passageway will help alleviate the reliance placed on Water Tunnel No. 1 (dating to 1917) and Water Tunnel No. 2 (dating to 1936). Tunnel No. 3 will allow these older tunnels to be shut down, inspected, and repaired for the first time since they came online nearly a century ago. In an attempt to physically trace some of the geologic and infrastructural flows of New York City’s water system for Geologic City, FOP decided to visit the one reservoir that exists within the five boroughs: Jerome Park Reservoir in the Bronx. The better known Central Park reservoir was decommissioned in 1993 due to the construction of City Water Tunnel No. 3. Apparently, should it ever be tapped, thirsty New Yorkers could drain the entire picturesque Central Park Reservoir within just four hours. 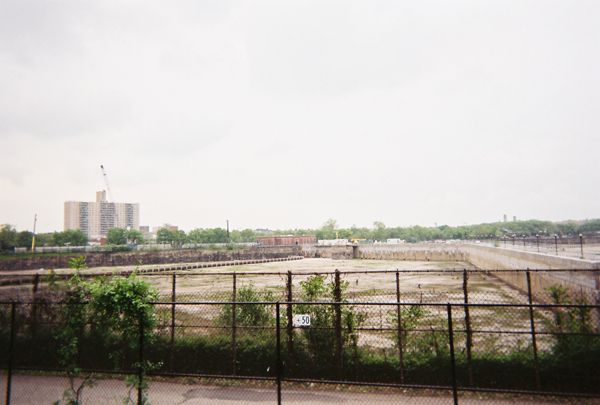 When we arrived at the Jerome Park Reservoir we found it completely drained, inaccessible, and looking more like an abandoned, shallow quarry than a vital part of metropolitan infrastructure. The Jerome Reservoir has been offline since 2008 because of the construction of the nearby Croton Filtration Plant, expected to be completed in 2012-13. The site includes a four-story plant being built entirely underground that will treat 1.2 million cubic meters of water per day. Once the Plant is completed, about 30 percent of the City’s water supply will pass though Jerome Park. Our visit gave us a palpable sense of the role that Jerome Park is designed have as a holding zone for the City’s water supply. As tends to be the case in New York, we left this site knowing that what we saw from street level was just a small piece of a more extensive network of infrastructure + geology that extended below our feet, into the depths of the bedrock and to locations far beyond the City’s edges. Downstream from Jerome Park, back in Brooklyn along the East River, it was easier to observe the City’s water flows in action. From the heights of the Brooklyn, Manhattan, Williamsburg or Queensboro Bridge, the force of water on the move is highly visible. Still, it’s likely that thousands of people who pass over these bridges each day, or stroll along the River’s edges, have not noticed that the River’s current changes directions twice each day. Five years ago FOP/smudge staged a project that attempted to signal the reversal of the River’s flow. East River Reverses anchored two volunteer kayakers in the East River for 6 hours. 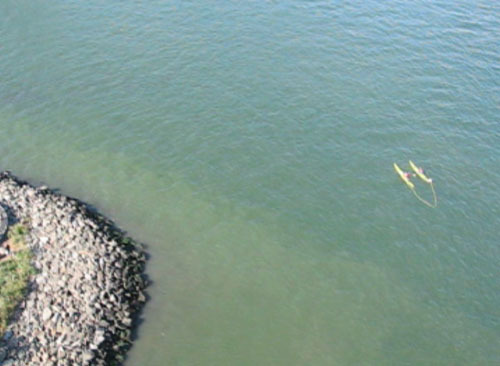 Over that time, their kayaks changed direction from pointing north to pointing south. We documented the phenomenon from above and along the water’s edge, addressed questions from passersby, and handed out information highlighting the fact that the East River isn’t actually a river, but a tidal estuary that reverses with the tug of the ocean tides. Similar to the fortuitous geomorphologies that assist the flow of drinking into New York, the East River’s tidal force is aiding an innovative energy project nearing Federal approval. Along the East Channel of the East River, Verdant Power plans to install 30 hydro turbines in 2012 for Phase 2 of the RITE project. The completed project will be the first tidal power plant in the world licensed to transmit energy onto a national grid. We find it inspiring that these turbines could generate power for more than three million homes by simply tapping into the geologic forces that have been at play in the region for the past several thousand years. 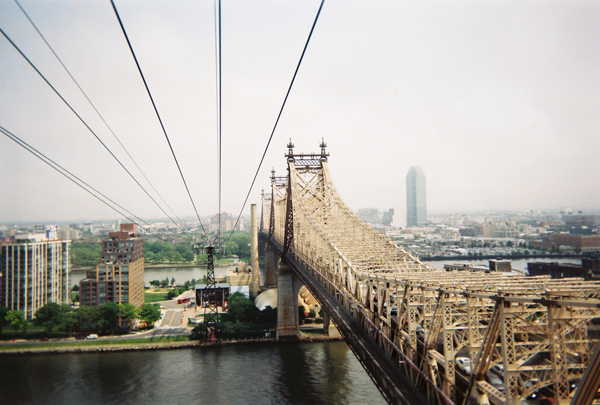 In late May we rode the tram from Manhattan to Roosevelt Island and took a look at the potential site. The tidal power plant project has had multiple initial attempts. The tides proved so strong, they literally destroyed the blades of the prototypes. The initial turbine blades were made of fiberglass stretched over a steel skeleton. The next iteration used aluminum magnesium alloy blades. In the next attempt, the blades will be composed of fiberglass-reinforced plastic and iron. Perhaps this fusion, composed of both Precambrian and Anthropocene materiality, will be up for the challenge of meeting the River’s massive tidal forces. For FOP, the RITE project dramatically highlights the often overlooked geologic forces that course right through in the City. 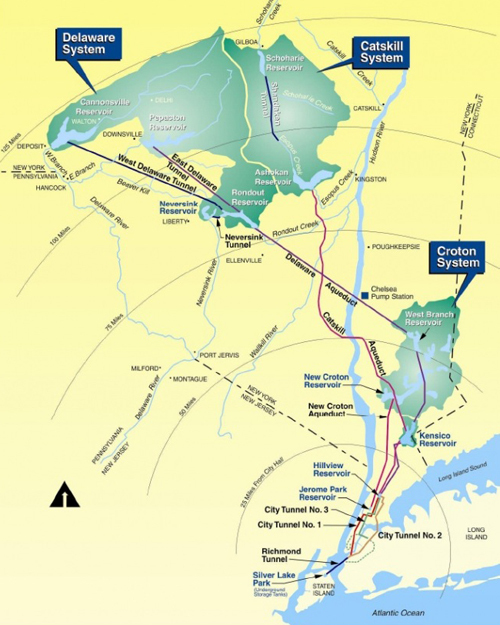 Designers and engineers of this project have chosen to tap one of the City’s dynamic geologic flows in a way that brings something unprecedented into reality. With the tidal power plant, humans assemble with the geologic force of the East River to remix water, as a geologic agent, with other earth materials and forces in ways that create not only energy, but also a more elaborated version of New York as geologic city. 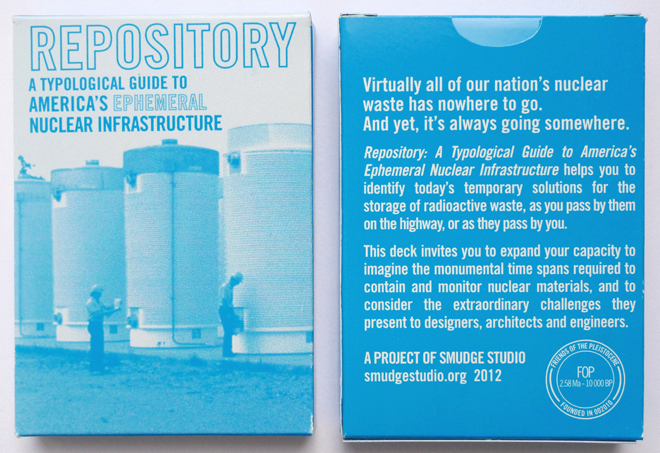 With these last site visits complete, we now step back from our field reports to design and produce the print version of the Geologic City field guide. We’ll have updates later this summer and information about the piece’s availability in early fall. Stay tuned!